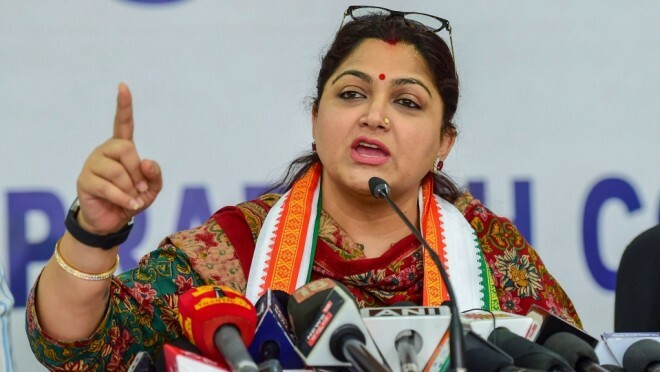 New Delhi, Apr 12: Actor-turned-politician Congress leader Khushbu Sundar was seen slapping a man who allegedly misbehaved with her during an election rally. The incident occurred when Sundar was campaigning for Congress’s Bengaluru Central candidate, Rizwan Arshad in the Karnataka capital recently. The video shows Sundar jostling through a crowd at rally and suddenly turning and slapping a man. The man was taken away by a policeman. Sundar did not make any comment of her own but retweeted media reports. Many praised her for her action and "not putting up with any misbehaviour". She had joined Congress in 2014 and said that it was the only party that "can bring about unity among various castes and creeds". The video of the incident has gained a lot of attention on social media.